WASHINGTON, D.C. 2/5/10–It is interesting as a journalist how two or three writers come up with the same headline at the same time when doing a story. Yep, it happened last night as one sentence was pulled out of the SOTU address by our president to herald a new story. Several used that statement in their headlines. The sentence this column used was written immediately after the address. Having seen every State of the Union Address by every president since the age of 12 (85 now) this writer is now qualified to say that this was the best State of the Union Address ever made. It was a message of reconciliation, of two rival parties being able to work together for one cause–the good of America. There was also a message of hope, accomplishments, and patriotism. Never has America been a more divided country than during this century and especially at the time of this event. No matter how beneficial to the people a new law or idea could bring, the Democrats immediately come against it. Their entire goal seems to be to sabotage everything Trump offers. Then again, the Democratic Party is actually the Communist Party. Chuck Schumer was seen in the audience with a perpetual sly-snake half grin on his face as he mentally engineered how to take down President Trump. For political correctness, this column apologizes to the snakes in this world for suggesting they have faces like Schumer. Nancy Pelosi sat lemon-faced during most of the address even though there were times she HAD to applaud and stand up or face criticism. The Dems intended to sit out every standing ovation when President Trump hit it out of the park. The points he made were so solid that the Dems and Pelosi popped up, then glanced around confused as though an invisible spring sprung them up to their feet. A big protest was carefully planned by ‘women mistreated by misogynists’ such as President Trump (?) They all dressed in white, taking up a big visible section of the chambers to bring attention to themselves. The white dresses indicate how they are being held down by men and do NOT stand a chance of succeeding in this male-dominated world. How’s that again? These poor mistreated women in white who were protesting are official Delegates of the U.S. House of Representatives. The House now has more than 100 women in office. Ninety of those are Democrats. Not only that, President Trump, a highly successful businessman, has put more women in executive positions than anyone on record. ‘Held back’ women indeed! And the Democrat-Communist women are in the majority of women holding office in D.C. Yet they still are not satisfied. Republicans jumped to their feet again and again when Trump said the U.S. needs to crack down on people entering the US illegally. Mostly, Democrats stayed seated. Some booed when Trump described immigrants on the march to the US. Some chuckled when he referred to a “tremendous onslaught” of people coming over the border. Most sat in silence when he said that encouraging illegal immigration was “cruel.” These Democrats are destructive mental cases who do not want the U.S. to succeed. They want only a Socialist-Communist government where only the leaders will have excellent living conditions while the rest live in squalor and poverty. “Tonight, we renew our resolve that America will never be a socialist country.” A roar of approval could be heard. 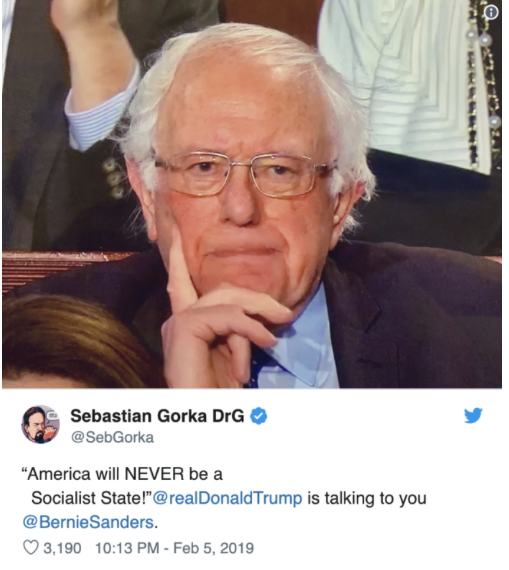 The camera then settled on Bernie Sanders in the audience whose face was so sour he must have been raised on dill pickles. That statement meant a lot to this writer personally, who totally rejects Socialism and Communism, knowing full well what it’s like to be under that dictatorship. Again this speech was beautifully crafted and delivered showing President Trump’s eagerness to work together with the Dems for the good of our country. But the Demrats wouldn’t have it. They only want to destroy America. They are not capable of civil discourse.. 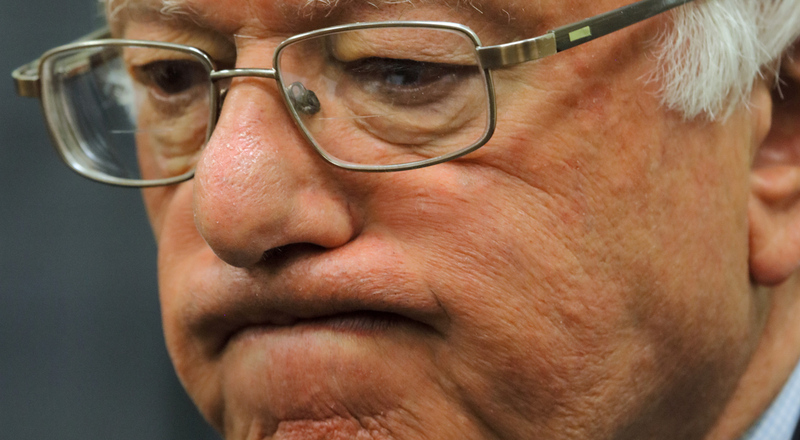 The Democrat Socialist Bernie Sanders is set to announce his presidential bid “imminently.“ Bernie would join Sens. Kamala Harris, Kirsten Gillibrand, Elizabeth Warren, Rep. Tulsi Gabbard, and former Obama HUD Secretary Joaquin Castro in making their 2020 plans official. Try not to have nightmares tonight.